Irish tattoos, Celtic tattoos…it’s all the same thing right, so what’s the big deal? Well, actually it’s not when you look at the two different types of tattoo designs. Irish tattoos, for the most part, consist of things like shamrocks, leprechauns, the Irish flag, and Gaelic sayings such as “Erin Go Braugh” (“Ireland Be Free”). Celtic tattoos deal more with geometrical latticed designs and sometimes animals. Let’s take a look at some of these designs in a little more detail, shall we? Leprechauns – As stated above, among the most popular Irish tattoo designs are leprechauns, who are native Irish fairies who possess hidden pots o’ gold and vicious mean streaks. If you listen carefully for the sound of the “tap-tap-tap” of a leprechaun’s hammer, you maybe be able to catch the crafty little fellow and make him reveal the hiding place of his treasure. But don’t take your eyes off him, for if you do, he will disappear instantly. Four-leaf clovers are the age-old universally accepted symbol of good luck (according to legend, Eve carried a four leaf clover from the Garden of Eden) with each leaf bearing a separate symbol. The first leaf is for “hope”, the second for “faith”, the third for “love” and the fourth, and most essential leaf, is for “luck”. The odds of finding a four-leaf clover is estimated at 10,000 to 1. Shamrocks are equally important and the symbolism attached to it is a result of St. Patrick, who brought Christianity to Ireland, established monasteries, schools and churches to aid in his religious teachings, in which he compared the Holy Trinity to the three-leafed plant (the three leaves represent the Father, the Son and the Holy Spirit, while the stem represents the godhead itself). Despite all the hoopla surrounding St. Patrick…he wasn’t an Irishman. He was actually born in Wales (circa 385 A.D) and if you’re one for legend, he is the reason that there are no snakes in Ireland today. The Serpents never returned after he drove them all out. Clovers, shamrocks…aren’t they the same thing? Well, yes and no. A shamrock is actually a smaller version of a clover, in fact, the word “shamrock” derives from the Irish word, seamrog, which translates to “little clover.” A four-leaf clover can’t be considered a shamrock because of the shamrock’s connection to the Trinity. A Claddagh ring is a famous Irish friendship ring, originating from the Claddagh village located just outside the old walls of Galway city, that illustrates two hands clasped together around a heart bearing a crown. The hands symbolize faith, the heart, love, and the crown, loyalty and fidelity. It is believed that this ring was derived from the Italian “fede ring” (also know as “faith rings”). There are several myths regarding the origin of this ring and one supposed true tale. We’ll outline just a few for you here. One popular myth dates back to the time of the Gods, to one in particular, Dagda, the father of the gods (with power enough to make the very sun stand still). Dagda is said to represent the right hand of the Claddagh ring. The left hand represents that of Anu (who later became Danu), the ancestral and universal mother of the Celts. The mythical Beathauile represents the Crown, and the heart represents the hearts of all of mankind, and the element which gives everlasting music to the Gael. Another myth tells the tale of the king of the small fishing village of Claddagh, who fell madly in love with a peasant woman, but because of her lower status, his love was forced to go unrequited. In his turmoil, the king killed himself and had his hands chopped off and placed around his heart as a symbol of his undying love for the peasant woman. The supposedly true story is of a Galway slave, Richard Joyce, who was being shipped to a West Indies plantation owner. He was spared this fate, however, when was captured by a band of Mediterranean pirates and sold to a Moorish goldsmith, who taught him the trade. In 1689, Joyce was given his freedom and he returned to Galway to set up shop in Claddagh, where he eventually designed the ring. Did you know that the way a Claddagh ring is worn sends the message of how love stands in the heart of the ring bearer? If worn on the right hand with the heart facing out, the ring says that the bearer’s heart is not yet won. On the right hand with the heart facing in, it tells the world that the ring bearer is under love’s spell and the two lovers have become engaged. And when worn on the left hand with the heart facing in, it shows the world that the ring bearer’s love has finally found a home in marriage. The symbol of the Fighting Irish (the “Irish” in this case refers to the “University of Notre Dame”) has an authentic history and a meaning deeper than race. It keeps alive the memory of a long, uphill fight for recognition against a spirit that was not always generous, nor even fair-minded. The name originates from the old press reports that would refer to local colleges by the denominations that founded the schools, such as the “Baptists” or the “Methodists”, for example. For Notre Dame it was the “Catholics,” or the “Irish”, although the players were never all of Irish ancestry; nor were they all Catholics. As with certain other tattoo designs (religious and zodiac symbol tattoos, for example), Celtic tattoos are not gender specific, but rather tend to deal with humans as gender neutral. When you peruse the Celtic/Irish category, you’ll notice that most of the Celtic artwork is characterized by complex “plaitwork” (also called “knotwork”) patterns. These Celtic knot symbolizes the “Thread of Life”. This is primarily because the Celts believed the human soul is a fragment of the divine that, through successive rebirths that will rid the soul of its impurities and ultimately return to its divine source. The interlaced unbroken patterns symbolize the process of humankind’s eternal spiritual evolution. Have you ever stared at a Celtic knot? I don’t mean just glancing at it, I’m talking about focusing your attention on it and nothing else. You will find yourself drawn in as the design pulls you in and compels your psyche to follow the knot’s intricate paths. For this reason, Celtic knots are used as an aid to meditation since it occupies the conscious mind with a demanding repetitive task of tracing the thread. Although not documented as fact, it’s believed that the Ancient Celt’s religion prevented them from depicting the works of the creator (plants, animals, and humans) so artists created geometrical spiral, key and step patterns that represented these aspects. Hallstatt designs date back to the Bronze Age, and are often mistaken for tribal art. It dealt mainly with geometric, maze-like designs that often repeated patterns to make the designs feel complex. La Tene are very organic spiral and leaf shaped design that often depict shapes of faces and animals camouflaged in the artwork. Knotwork Interlace, or “plaitwork” as discussed earlier, is what comes to mind when people think of Celtic art. If you’re among the few not familiar with this design, it’s simply a series of braided strips that bend on itself and connects to make one continuous, overlapping pattern. The most common example of this is the “Triquetra” (Trinity Knot), which has 3 outer points or petals, and some weavings occurring within the center. This plaitwork is typically found in the body of most Celtic crosses. Spirals (double, triple or quadruple swirls) are typically joined to one another in either an “S” or a “C” design shape. It’s considered to be a relative to the triskelion spiral family, which has 3 arms or curls radiating from the design center. Long before the idea of etching a dragon symbol in ink on human skin became fashionable, Arthur Pendragon, King of the Arthurian Legend, had the symbol of the Celtic dragon emblazoned on his battle armor because it symbolized sovereignty, supreme power, insight and one who has conquered an enemy. In fact, the word “pendragon” (the etymology of which is: pen “head” and derkshal “to see clearly?) originally meant “Welsh warlord? but is more popularly identified today as “chief leader? or “king?. Today, Celtic dragon tattoos often depict the creatures as great winged beasts, but traditional Celtic dragons were originally depicted as a wyrm or water serpent, often intertwined in the classic Celtic knotwork. Since the Celtic dragons were wingless creatures, they traveled across the lands and their massively powerful bodies created veins (which are known as either “dragon? or “ley? lines) in the earth that supposedly act as a conduit for cosmic forces. And at the locations where one set of dragon lines intersected with another one or at sites where dragons actually rested, these spots are thought to be prominent points of concentrated power. Druids practicing geomancy sought out these spots to build megalithic structures, Stonehenge being one of the more famous edifices. The Celtic cross is a Christian cross with a circle overlying the point where the lines meet (see: Celtic Cross), and the oldest Celtic crosses were carved into large slabs of rock that lay flat on the ground. Later versions were often decorated with interlaced knot work, spirals, key patterns, animal figures, foliage designs, and Biblical stories. Some suggest that the Celtic cross is derived from the Chi Rho symbol popularized by the Christian Roman emperor Constantine. “Chi” and rho” are the first two letters of “Christ” in Greek, and the overlapped letters are similar to the equal-limbed cross at the center of the Celtic cross. The eight-rayed symbol of Celtic sun designs is slightly more difficult to pinpoint accurately due to conflicting information. Depending on which myth you subscribe to, in this case Druidic, the “sun wheel” was the symbol for Taranis, the Celtic sun god (which is why it was also known as the “wheel of Taranis”). However, Taranis was also known as the “Lord of the Thunder” (since “Taranis” comes from the Gaelic meaning “thunder”). Belenos (later known as Beli Mawr), also shared the title as the Celtic god of the sun, and like Apollo, he rode the Sun across the sky in a horse-drawn chariot. 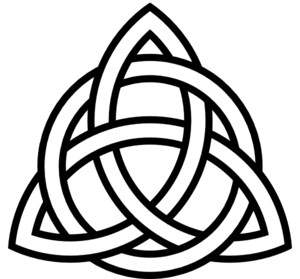 Plaitwork (Knotwork Interlace) Celtic tattoos suggest an interconnection of life and humankind’s place within the universe, while the Trinity knot represents the Holy Trinity (modern belief) or the triple gods and goddesses of the ancient Celts. The Lover’s Knot (intertwined infinity symbols), quite naturally, represents two beings coming together as one. A spiral Celtic tattoo design speaks to the personal spirit, and an individual’s attainment of balance in the inner consciousness and outer self. Life’s too short not to be Irish!